Base of Operations: Unrevealed, but mobile within Shi'ar space. Powers/Abilities: Shakati has no superhuman physical powers. He does have great wealth and influence across a large portion of an unspecified galaxy. Shakati is liked and even trusted by many, but he is willing to betray anyone and anything if the price is right. He may be a complete hedonist, willing to do anything for pleasure, or to provide the same for others (for the right price, of course). He may have a, shall we say, fondness for young men. 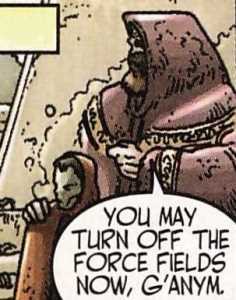 History: Kyras Shakati has established a great degree of influence across the galaxies while posing as a peaceful merchant. (Uncanny X-Men#125) - Shakati, accompanied by Arak and Arion, attended the newly-crowned Shi'ar Empress Lilandra's first state ball on the world called "Imperial Center." (Inhumans IV#2 (fb) - BTS) - At some point, Shakati crossed paths with Prince Jason of Spartax but the details of this encounter have not yet been revealed. (Inhumans IV#2 (fb) - BTS) - At some point, Prince Jason of Spartax did something which placed the Commercial Guilds in his debt. Whatever this act was, it may (or may NOT) have involved Shakati. (Inhumans IV#2 (fb) - BTS / Inhumans IV#4 (fb) - BTS) - At some point, under circumstances which have not yet been revealed, Kyras Shakati was contacted by Ronan the Accuser, the most powerful of the Kree warlords. Ronan wanted revenge against the Shi'ar Empire which had annexed the devastated Kree Empire after the Kree-Shi'ar War, and he saw the upcoming alliance between the Shi'ar and Spartoi Empires as providing an opportunity. Ronan planned to use the Inhumans, whom he had enslaved, to murder the Shi'ar Majestrix Lilandra Neramani in the hope that this assassination would lead to a war between the Shi'ar and the Spartoi that would destroy them both, leaving the Kree Empire to be reborn from the ashes. Shakati agreed to work with Ronan in carrying out this plan. (Inhumans IV#4 (fb) - BTS) - Privately, Shakati believed that Ronan's plan was impossible to fulfill as a whole and so he made plans of his own that would enable the merchants to profit no matter how Ronan's plot turned out. (Inhumans IV#2 (fb) - BTS) - After capturing and enslaving the Inhumans, Ronan forced them to act as a multi-racial group of renegade marauders who began attacking the outer rims of the Shi'ar Empire. (Inhumans IV#2 - BTS) - Months later, Shakati and his aide G'anym were aboard a Shi'ar transport vessel when it was attacked near a stargate in the Greater Magellanic Cloud by the "marauders" who teleported aboard from their mobile stronghold (Attilan). As part of Ronan's plan to plant Inhuman agents amongst the new warriors who were candidates for membership in the Shi'ar Imperial Guard, the Inhuman boarding party followed an attack plan designed to manipulate the Shi'ar commander, Captain P'krrd, into evacuating most of his ship's passengers and crew via the escape pods. Once their secret objective had been met, the marauders retreated, teleporting back to their stronghold which then evaded the recently-arrived squad of Spartoi ships by fleeing through the stargate. With the danger passed, Captain P'krrd ordered the retrieval of as many of the escape pods as possible, an order which unknowingly brought aboard an imitation pod containing the Inhuman Karnak. (Inhumans IV#2) - Once his escape pod had been brought back on board the Shi'ar vessel and opened, Shakati exited it, complaining about the lack of air and how his "loyal G'anym" had been about to faint. Upon being greeted by Jason of Spartax, the leader of the Spartoi squad, Shakati stated that the Commercial Guilds were in his debt once more. Shakati's complaints about how their hosts, the powerful Shi'ar, had not been able to keep them out of danger prompted P'krrd to offer Shakati the use of his own cabin until they arrived at their destination. Shakati accepted this offer but mentioned that he was going to send a formal protest to the Shi'ar embassy on his homeworld. Later, still aboard the Shi'ar vessel, Shakati shared a meal with Milord Jason and Captain P'krrd during which they discussed the marauders and the fact that they seemed to be an alliance between alien races. Shakati suggested that they were a cabal of soulless renegades who attacked ships and forced crews and passengers to join their ranks but P'krrd stated that no recruiting raids had been reported in Shi'ar space. When asked if the Guilds knew anything about the marauders, Shakati claimed that the business of the Guilds was rare spices and commercial goods, not little known alien beings. 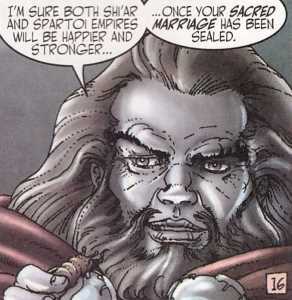 Shakati then mentioned the upcoming "sacred marriage" between the Shi'ar and Spartoi Empires and stated that "when there is union, there is profit." (Inhumans IV#2) - Two weeks later, Shakati and G'anym were in Shi'ar space aboard the transit station known as "the Melting Pot" awaiting the arrival of three Inhumans (Black Bolt, Medusa and Gorgon) who were posing as Kree squires but actually were Ronan's unwilling assassins. As he and Ronan had agreed, Shakati acted as a contact for the Inhuman trio who were the pawns that would bring a successful end to their dark agenda. Once they met, Shakati announced that they were "all still in time to be invited to...a wedding." (Inhumans IV#3 (fb) - BTS) - Shakati and G'anym provided ID chips to the Inhuman trio that would enable them to travel to Kritnah, a former Kree planet whose sacred city of Kritnalar was to be where the ceremony of the symbolic wedding between the leaders of the Shi'ar and Spartoi Empires would take place. (Inhumans IV#3) - After arriving on Kritnah, the three "Kree refugees" were attacked in a street in Kritnalar by scavengers (including Pogo) who stole their ID chips before being driven off by a Spartoi patrol led by Prince Jason. Several hours later, in another part of the city, G'anym bought the ID chips from Pogo. Once the street punks had left, G'anym, with Shakati watching, disintegrated the ID chips so that there would be no evidence linking the three Inhumans to Shakati and G'anym. When G'anym asked if the plan was still in motuion, Shakati replied that it was and proceeding smoothly, and that the three Inhumans had been planted "as have the other two" (Karnak and Triton). (Inhumans IV#3) - Days later, after the symbolic marriage between the Shi'ar Majestrix Lilanadra Neramani and Spartoi Emperor Eson had been completed, Shakati and G'anym were present at the ceremony during which Lilandra personally awarded the property titles for the frontier planets between the two empires to the Spartoi settlers and then to representatives of the millions of Kree slaves who were to serve these new masters. (Inhumans IV#4 - BTS) - During the chaos of the attempted assassination of Lilandra, Shakati and G'anym were protected (and possibly hidden) by portable force fields. (Inhumans IV#4) - Later, after the Shi'ar and Spartoi delegations had departed from the scene of the failed assassination of Lilandra and the subsequent cancellation of the alliance between their empires, Shakati instructed G'anym to turn off the force fields. Shakati then began to gloat about the outcome, pleased that the frontier between the empires would remain, thus allowing for customs, caravans, shipments, smuggling...all those things that gave the guilds profit. Shakati then mentioned that Ronan hadn't even suspected that his plan was impossible to fulfill as a whole but that "we merchants" had bet on all the odds. Shakati finished his gloating by laughing about how "warriors are so naive." (Inhumans IV#4 - BTS) - Weeks later, aboard distant Attilan, Ronan the Accuser brooded about how he had been tricked by a "simple merchant" and vowed that Shakati of the Guilds would "sooner or later" suffer his vengeance. Comments: Created by Chris Claremont and John Byrne. Officially connected to Reality-616 by Carlos Pacheco and Ladronn. Popeye the Sailor Man. Thanks to Robert McKinney for pointing out the Star-Lord characters in this issue. Byrne (and possibly Claremont) presumably meant Shakati's appearance to be an homage/tribute to themselves, as UXM#125 was published a couple years after Marvel Preview#11, in 1979. At that point, there was not much reason to suspect Star-Lord's stories to be part of the MU's canon, or to be a part of Reality-616. 1. The character of Kyras Shakati first appeared in Marvel Preview#11 (Summer, 1977) in a story written by Chris Claremont and penciled by John Byrne. At the time there was no indication that Star-Lord and his cast were meant to be part of the "mainstream" Marvel Universe. 2. 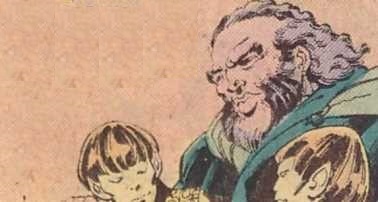 Characters who looked like Kyras Shakati, Arak, Arion and Dirac appeared in a single panel of Uncanny X-Men #125 (September, 1979). Since that story was also drawn by John Byrne, those cameo appearances may have been meant as an homage to his (or their, if Claremont was involved) past work on Star-Lord. On the other hand, the presence of a Pierson's Puppeteer from Larry Niven's "Known Space" universe and Popeye the Sailor Man could mean that Byrne drew them into the crowd scene just for his own amusement. 3. Kyras Shakati last appeared in Inhumans IV#2-4 (July-August+October, 2000) in a storyline written by Carlos Pacheco and Rafael Marin that was definitely set within the Reality-616 continuity. The co-writers had wanted to introduce Star-Lord into the Marvel Universe but felt that the past continuity of Peter Quill posed a problem because he had always been alone in his own pocket universe which seemingly had no other MU characters in it. To get around this problem, they decided to use Peter's father, Jason, as the Star-Lord character. As a result, this Inhumans miniseries acted as a prequel to the "classic" Star-Lord stories, with both Jason and Shakati appearing in Inhumans IV#2-4 decades before their appearance in Marvel Preview#11. Presumably this is why Shakati has brown hair in the mini as opposed to the black and white hair he had in his first published appearance. However, this attempt to integrate Star-Lord into the MU was not entirely successful. Aside from the fact that it meant shifting all of Star-Lord's stories at least forty years into the future, thereby making it almost impossible for any new Star-Lord adventures that took place in the "present-day" MU to be published until 30 "Marvel Time" years had past (i.e., until about 2090-2120 AD), there were also some inconsistencies between Jason of Sparta's backstory and Jason of Spartax's possible future. One such inconsistency was the idea that the scout ship in which Jason had crashed on Earth was actually his sentient Soulship. Another was that the precognitive's vision included an image of Jason standing with the Earthwoman who had born his child and her holding a bundle in her arms that was (presumably) their child. This did not fit with the earlier story in which Jason left before Meredith was even showing and didn't met his son until he was the adult Star-Lord. So, while this attempt to bring Star-Lord and his adventures into "continuity" was well-meant, it also had flaws which were never really addressed and/or corrected. 4. Fortunately for us all, writer Brian Michael Bendis came along and fixed all these lingering continuity problems (and that is a statement that I never thought I'd type). 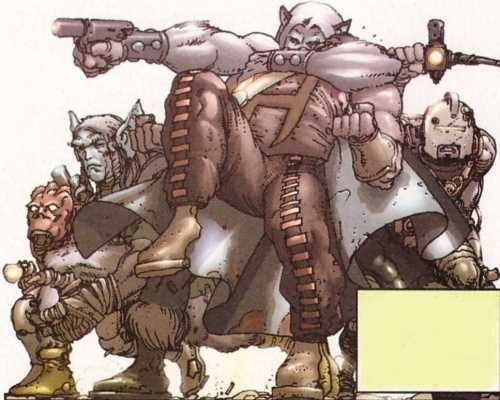 In Guardians of the Galaxy III#0.1, Bendis introduced his the "streamlined and updated" origin which he had created for the Star-Lord who exists in Reality-616 and fans who cared about continuity quickly realized that this Bendisized origin was essentially a re-imagining of the character, one that was so different from the "classic" Star-Lord that it was impossible to reconcile the two versions. As a result, some fans came to the conclusion that the only reasonable explanation was that these origins actually had to relate to two DIFFERENT characters or, to be more precise, two different versions of the same character who existed in different realities within the Marvel Multiverse. This idea has now been officially accepted and all Star-Lord adventures which were published in the 20th Century have been relegated to Reality-791. In short, the Kyras Shakati who plotted against Emperor Jason of Sparta in Marvel Preview#11 exists in Reality-791 while the Kyras Shakati who knows Jason of Spartax and conspired with Ronan the Accuser exists in the "mainstream" Reality-616. Of course, even this solution has some problems, like why the 616 versions of Shakati, Jason, Meredith and Peter are all somewhat younger than their 791 counterparts. however, the biggest problem is that there are now TWO Jasons within Reality-616: Prince Jason of Spartax, the banished (and so far childless) heir to the Spartoi Empire which exists within the Greater Magellanic Cloud, and King J-Son of Spartax, the father of Reality-616's Star-Lord and ruler of the Spartax Empire which apparently is located within the Milky Way Galaxy. Personally, I am dreading how BMB will handle this situation. Although Shakati looks like a Caucasian human from Earth, he is (almost) certainly not a Terran (unless, like Omega Core member Cole from the Kyln, he was abducted from Earth by aliens). Given his interest in the proposed Shi'ar-Spartoi alliance and the fact that the Spartoi race are also identical-to-Caucasian-Humans, the obvious answer would be that Shakati, like Prince Jason, is a member of the Spartoi species whose empire exists within the Greater Magellanic Cloud. However, there is another possibility, one involving his Reality-791 counterpart. Like the 616 Shakati, the 791 Shakati's race was never specifically named but the default theory was that he was a member of the same "Spartan" race as Emperor Jason and Prince Gareth. this is interesting because the "Spartan" Empire in Reality-791 is apparently located within the Milky Way Galaxy and thus is NOT the other-dimensional counterpart to the Spartoi Empire. Instead, a more likely counterpart to the "Spartans" would be the Spartax race who rule the Spartax Empire in Reality-616's Milky Way Galaxy. This theory is supported by the fact that Emperor Jason of Sparta and King J-Son of Spartax have each mated with their reality's version of an Earthwoman named Meredith Quill and fathered sons named Peter Jason Quill who grew up to become cosmic adventurers who call themselves Star-Lord. Of course, this still doesn't explain why there are two different interstellar empires in Reality-616, each ruled from different planets named Spartax located in different galaxies. My best guess, which is mere speculation, is that originally there was a single empire based in one of the galaxies which then expanded into the other galaxy. As part of this expansion, maybe the planet chosen to be the "local" capital world in the new galaxy was named "Spartax" after the original homeworld. Eventually, something happened which caused the single inter-galactic empire to split into two separate political entities, the Spartoi Empire in one galaxy and the Spartax Empire in the other. If this "fanfic" explanation were true, then that would mean that the Spartoi and Spartax races are (or were) actually a single species. Personally, I like this theory because the idea of so many identical-to-Caucasian-human races roaming around in the MU seems seems, at best, rather unimaginative. At worst, it seems almost racist, like the "human" shape and Caucasian skin color are somehow "preferred" by the universe. Although I'm not absolutely sure that that is Shakati and G'anym standing near Lilandra (in the second image down on the left), they look close enough (large man with a brown beard wearing a brown robe with a gold braid pattern around his shoulders and standing with his hand on the shoulder of a boyish companion wearing a red cloak) that I'm willing to take a chance on it being them. When I first read the story in Inhumans IV#3 I assumed that it was part of Shakati's plan to have the ID chips which he had given to Black Bolt, Medusa and Gorgon stolen from them once they had gotten to Kritnalar so that they couldn't be traced back to him if the Inhumans failed or were caught. It was only when doing this profile that I realized that there is no real evidence that Shakati had arranged the mugging by having G'anym hire Pogo to target a particular trio of "Kree refugees." Accordingly, a more likely theory is that Shakati had expected that such a theft might occur and had arranged for it to be known (among Kritnalar's criminals) that G'anym would be willing to buy any such stolen ID chips. It also seems like a rather unlikely coincidence that, after their ID chips were stolen, the three Inhumans "just happened" to met Prince Jason of Spartax who was so smitten by Medusa's beauty that he provided them with new gold datachips that allowed them close access to their intended target, Lilandra. It would be more plausible if someone (Shakati) had arranged for these events to happen but I just can't find any evidence of such manipulation. I guess that Black Bolt and his friends just got lucky. Updated and revised profile by Donald Campbell. Arak and Arion are two seemingly-identical members of an alien humanoid species whose name has not yet been revealed. They apparently accompanied merchant Kyras Shakati to the first state ball held by the newly-crowned Shi'ar EmpressLilandra on the world called "Imperial Center." Note: Little is known about these characters as they exist in Reality-616 as not even their actual names have been revealed. However, if they are the Reality-616 versions of the Arak and Arion who exist in Reality-791, then chances are good that they are similar to their other-dimensional counterparts. And if that's the case, then Arak and Arion would be twin brothers who worked for Shakati as his bodyguards (and they may have been...close...to Shakati in other ways). From time to time, they would have partaken of the decadent pleasures with which Shakati surrounded himself. They would also enjoy using knives on young women, either to kill or to inflict pain. They may have referred to any woman whom they targeted as a "Pretty-pretty." G'anym is a member of a humanoid alien race whose name and homeworld have not yet been revealed. 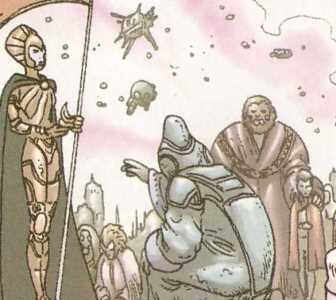 During the period when the Shi'ar and Spartoi were trying to form an alliance between their two empires, G'anym was an aide to the merchant Kyras Shakati. Despite G'anym's youthful appearance and sometimes seemingly-childish behavior, Shakati trusted him with the full details of the conspiracy against Lilandra. (Inhumans IV#2) - G'anym was Shakati's aide who traveled with him aboard a Shi'ar transport vessel and they shared an escape pod when an attack by marauders forced an evacuation. Later, after their pod had been recovered and opened aboard the Shi'ar starship, Shakati complained about the lack of air within the pod and claimed that his "loyal G'anym" had been about to faint. Later, as Shakati shared a meal with Captain P'krrd and Lord Jason in a dining hall on the Shi'ar vessel, G'anym sat nearby playing some sort of computer game (that may have been an interstellar version of video poker). 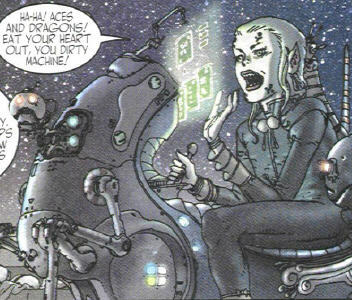 When his game-playing achieved an "Aces and dragons" result, G'anuym laughed and said, "Eat your heart out, you dirty machine!" (Inhumans IV#2) - Two weeks later, G'anym and Shakati were in Shi'ar space aboard the transit station known as "the Melting Pot" where they made contact with three Inhumans (Black Bolt, Medusa and Gorgon) who were posing as Kree squires but actually were Ronan's unwilling assassins. (Inhumans IV#3 (fb) - BTS) - G'anym and Shakati provided the three Inhumans with ID chips that would enable them to travel to Kritnah, a former Kree planet whose sacred city of Kritnalar was to be where the ceremony of the symbolic wedding between the leaders of the Shi'ar and Spartoi Empires would take place. (Inhumans IV#3) - On Kritnah, several hours after the three "Kree refugees" had been robbed of their ID chips by Pogo's scavenger gang, G'anym met with Pogo and his gang and bought the stolen ID chips from him. After telling Pogo to take care of his nose because it was bleeding again, G'anym moved away with the ID chips which he dropped on the ground and then disintegrated with a handheld weapon. As G'anym complained about the nasty smell and asked why ID chips couldn't disintegrate without a fetid stench, Shakati told him it was time to go. G'anym then asked "Master Shakati" if everything was in order and if the plan was still in motion to which Shakati replied, "Still in motion, and proceeding smoothly." (Inhumans IV#3) - Days later, after the symbolic marriage between the Shi'ar Majestrix Lilandra Neramani and Spartoi Emperor Eson had been completed, G'anym stood beside Shakati at the ceremony during which Lilandra personally awarded the property titles for the frontier planets between the two empires to the Spartoi settlers and then to representatives of the millions of Kree slaves who were to serve these new masters. (Inhumans IV#4 - BTS) - During the chaos of the attempted assassination of Lilandra, G'anym and Shakati were protected (and possibly hidden) by portable force fields. (Inhumans IV#4) - Later, after the Shi'ar and Spartoi delegations had departed from the scene of the failed assassination of Lilandra and the subsequent cancellation of the alliance between their empires, G'anym was told by Shakati to turn off the force fields. G'anym then stood by as Shakati gloated about the outcome of their plan. Note: It should be mentioned that, despite his small stature and boyish appearance, there is no real evidence that G'anym is a child. The fact that nothing has been revealed about his race makes it quite possible that he could actually be an adult (and fully-grown) member of his species. Similarly, the fact that Shakati only referred to him as "my loyal G'anym" or "my faithful G'anym" when they were in public could indicate that Shakati's use of those terms was meant to deceive onlookers into believing that the relationship between them was something other than what it really was. Or not. 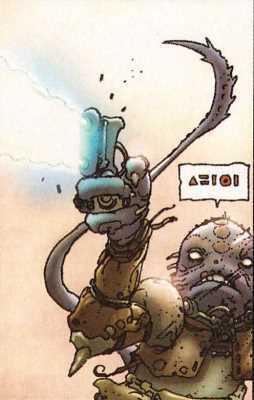 Pogo was a member (and perhaps the leader) of a gang of five scavengers who prowled the streets of the city of Kritnalar on the planet Kritnah, a former Kree world (and religious center) located within the Greater Magellanic Cloud. He and the other members of the gang were street thieves who preyed upon the pilgrims who came to Kritnalar. (Inhumans IV#3) - Some days before the ceremonial marriage between the Shi'ar and Spartoi Empires was to be held in Kritnalar, Pogo's gang ambushed three Kree refugees in the street by jumping down on them from a wall. 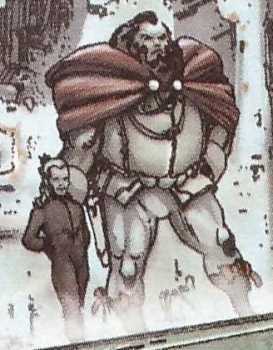 While one thug (from the same race as Pogo) grabbed Gorgon from behind, Pogo asked the "pigeon-pilgrims" for any "money-clink" in their pouches. Another thug then fired at the other two refugees but was swiftly knocked down by Medusa. Gorgon almost used his powers against them but remembered their need for secrecy and allowed himself to be pinned. As a fin-headed thug began to search Gorgon for ID chips, the helmeted thug saw the other two moving and shot Black Bolt with a stunner. Seeing this, Pogo, who hadn't gotten involved yet, remarked that it was incredible that the ray had hit him full-on and he hadn't uttered a "painsound." Pogo wondered aloud if the target was a "silentmute" but his musings were cut short when Medusa kicked him in the face. Seconds later, the duo holding Gorgon found the ID chips just before a Spartoi patrol (led by Prince Jason) arrived. After a brief scuffle, the scavengers fled and the patrol let them go because they weren't worth the effort. Several hours later, in another part of the city, the scavengers met with G'anym who made a deal with Pogo for the ID chips. As G'anym handed over a pouch of money, he told Pogo to take care of his nose which was bleeding again. The scavengers then left while G'anym disintegrated the ID chips. The image to the left features Pogo, the only member of the gang to be named. He has larger ears than the other scavenger who is also of his species. The scavenger in the near-right image is the one who shot first and was taken down by Medusa. The far-right image shows four members of the gang surrounding Gorgon. From left to right, they are: fin-headed, Pogo (with the large ears), a member of Pogo's species (but with smaller ears), and the metal-helmeted humanoid who shot Black Bolt. All characters mentioned or pictured are ™ and © 1941-2099 Marvel Characters, Inc. All Rights Reserved. If you like this stuff, you should check out the real thing!